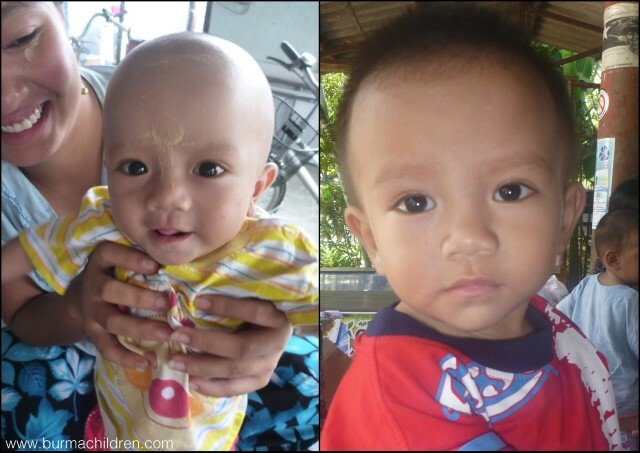 Phyo Wai Yan Soe is a 3 year-old boy suffering from kidney stones and bladder stones. Phyo Wai Yan Soe frequently cries whenever he passes urine as he feels pain and passes blood at the same time. Phyo Wai Yan Soe’s family originally came from Durin Seit village, Tha Tong, Mon State in Burma. His father earned a living as a fisherman and sometimes received 8,000 kyat (US $8) per day for his work, but the work was inconsistent and he did not earn a daily wage. His oldest brother makes herbal medicine and he earns 200,0000 kyat (US $200) per patient and his income is dependent on when he gets customers. If his customers order more medicine he will receive more money. Phyo Wai Yan Soe’s oldest brother also supports his family with his income. His mother stays at home and takes care of her other children. Their family situation is difficult and sometimes they have to borrow money when someone becomes ill in the family. Phyo Wai Yan Soe’s family moved to Mae Sot just 3 months ago to find a better job with more income. His father now works as a construction worker and earns 150 Baht (US $5) per day. His 15-year-old brother also works on the construction site and earns 120 baht (US $4) per day. His mother stays at home and takes care of the his siblings. Their income is just enough for the family but there is no extra money for other needs. When Phyo Wai Yan Soe’s family moved to Mae Sot none of his siblings can attend school because his parents cannot afford their school fees.Previously, Phyo Wai Yan Soe and his family stayed with his aunt’s family and had to pay 2500 baht (US $75) for the house rent and 400 baht (US $13) for water and electricity fees per month. Later, Phyo Wai Yan Soe’s family moved to a small tent next to the construction site so they wouldn’t have to pay these house, water and electricity fees. From July 2012, Phyo Wai Yan Soe experienced problems when passing urine regularly. He passed urine with blood one day and his mother bought some Burmese medicine for him. He got better for a while, however, on February 4, 2013, he began experiencing a lot of pain. Two days later he came to Mae Tao Clinic. He especially experienced a lot of pain at night and he felt more pain when urinating. His mother brought him to Mae Tao Clinic and he had a urine test, and received medicine. The medics at Mae Tao Clinic told his mother that he had urinary tract infection. The doctor told his mother that if he has high fever or any other problems he should come back to Mae Tao Clinic. Phyo Wai Yan Soe got better after taking the prescription medicine but when the medicine finished, he started to feel pain again when urinating, so his mother brought him back again to Mae Tao Clinic on 26, Feb, 2013. On March 1st, 2013, he was referred to Mae Sot Hospital for an X-ray and urine test. His family was told he had kidney stones and needs to go to Chiang Mai for further treatment. Phyo Wai Yan Soe received further medication and he was referred to BCMF. Currently, he can play, eat and sleep well, and only experiences pain when urinating. But he looks smaller than his age. His mother is very worried for her son and is stressed with the financial problems accessing treatment means for his family. On February 28, his mother started to work at the construction site as well but because of her son’s health problem, she had to quit working and has no time to take care of the other children. His mother hopes that in the future her son will get better and go to school.